I Love You More Than Carrots: The M Family Does NOLA :: A Sneak Peek! 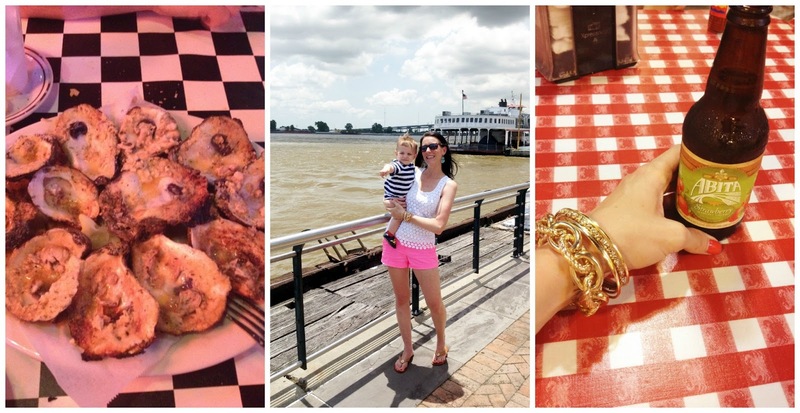 A little over one week ago, I shared this post where I asked you, my awesome readers, for recommendations of must-sees, must-eats and must-dos while visiting New Orleans. I asked and holy cow, did you all answer. At first I was overwhelmed with suggestions but as I sat down and planned out our itinerary, little by little everything began to fall into place. With two days under our belt here in the Big Easy, I wanted to pop in and share some of our trip here on the blog. If you're following me on Instgram or Twitter, then you've most likely already been privy to these photos. I've been trying to break out my big girl camera as much as possible- the city is filled with incredible photo opportunities. From breathtaking backdrops along the Mississippi to gorgeous architecture lining the culture-rich streets, it's a shutterbug's dream. Until I'm able to get home and upload those photos, these cross-posted iPhone pictures will have to suffice! Our first two days in New Orleans have flown by. They've been packed with so! much! fun! that on our walk to breakfast yesterday morning I casually said to my husband that I kind of wished we could extend our stay. I also contemplated moving here but that's a post for another day. I'm kind of falling in love with New Orleans. The people, the sights, the rich culture, the fried food.. Oh lord. The fried food. Maybe it's better that we're only here until Sunday- wasn't my 2013 goal to be college hot and not knocked up? Whew. Between the poboys and the hurricanes, that's a goal that's get increasingly difficult to keep! Upon arriving, we checked into the JW Marriott where we were welcomed with open arms. The staff here as been so incredibly helpful and hospitable and our parlor suite is just to die for. The staff never wastes an opportunity to dance in the hallway with Carter or hoist him up to a window to look out over the city and count streetcars. Carter knew exactly what to do as soon as we walked into our gorgeous suite and that was immediately run and jump on his roll-away cot. The husband and I knew what we needed to do and that was immediately crack open a celebratory bottle of champagne for making it through another flight with two under three. A flight that was stuck on the ground for a little over an hour after an unexpected warning light came on as we were taxiing down the runway. Our days have been filled with delicious food and drink- I'm not sure which I've enjoyed more, the char-grilled oysters at Acme Oyster House or the beignets and frozen cafe au lait at Cafe Du Monde. I will say that we will be returning for beignets and coffee each day for the rest of our stay here. Maybe even twice per day. Even the toddler gave them two thumbs up and he loved listening to the live street music that accompanied our breakfast. I would be lying if I didn't add that he also loved the pigeons. We told him they were a special Nola breed. Mac, the ever constant observer, loves kicking back in the stroller and taking in the sights. He especially loved waving to all of the boats as we strolled along the Mississippi river. I had to stop and laugh when I turned back during a stroll down Bourbon Street to see my husband pushing our baby in the stroller. All I could think was, "You have a baby! ... On Bourbon Street!" The good news? We weren't the only ones and each time we passed a couple pushing a stroller, we raised our Styrofoam cup in solidarity. After burning off some energy in Jackson Square and enjoying a dip in the fantastic hotel pool, the boys slept soundly and woke early the next morning, ready to spend the day at the aquarium and insectarium. Talk about blowing a tiny toddler mind. Carter couldn't get enough of the fishes at the aquarium and he definitely asked if the albino alligator could come back to the hotel with us for a swim in the pool. Not to mention that we had to practically drag him out of the parakeet exhibit! I have a strange feeling he'll be asking for a pet bird as soon as we get home to Maryland. Even last night's rain didn't put a damper on our stay. A few laps around the hotel floor followed by a swim in the giant hotel bath tub and the boys were barely in their jammies before falling into a deep sleep. I'm telling you- if there's ever such a thing as too much fun, we're having it! So, what's next for the M Family as they take on The Big Easy? The Audubon Zoo, Louisiana Children's Museum, Sucre, Orient Expressed and a Riverboat Cruise on the Steamboat Natchez, just to name a few! Be sure to follow along with me and the boys as we continue to take in all that Nola has to offer! You can find me snapping and sharing away on Twitter and Instagram with the #followyournola hashtag! YAY!!! Hope it's not to hot and humid for you guys down there! Did you decide to do the Zoo Cruise? Umm, you already look college hot! Glad you guys are having such an amazing time! I have LOVED seeing all of the pics on instagram! It looks liek you guys are having a blast!!!! It looks like y'all are having a heavenly trip. NOLA is special to us, since it was our first-ever trip together for a formal just two weeks after we started dating. I think we may need to go for our 5-year anniversary this Christmas, don't you? Your trip sounds amazing! I was like you I never thought New Orleans would be that family friendly but it sounds like it is. Please forgive my ignorance but why would it be a bad thing to have a stroller on Bourbon Street?? Enjoy the rest of your trip! I am so thrilled you had a great time in my town! And I am still sad I couldn't come to meet up with you. Now *i* am sick! New Follower here. I love NOLA. We actually did Mardi Gras with our kids and it was very kid friendly in the St. Charles area.